Ely Cathedral by John Buckler (early 19th century). Last Saturday’s mild temperatures and lack of rain called me back to my bike. This time I was headed for Ely (pronounced as in Robert E. Lee), a city who has a small claim to fame due to its enormous cathedral. At one time an island where eel fishing composed a major part of its economy, drainage of the fens has made Ely accessible by cycle in the modern day. In theory. Many of my friends are well aware that I enjoy a good adventure, and many of my friends are well aware that in practice I my adventures come in equal measure with misadventure. The map gives my route to and from Ely, which you may notice are not the same. The route which veers off east is Google Maps suggested route. However, riding along the river seemed far more attractive, and Google Maps reports that Route 11 of the National Cycle Network runs snug against the waterway. 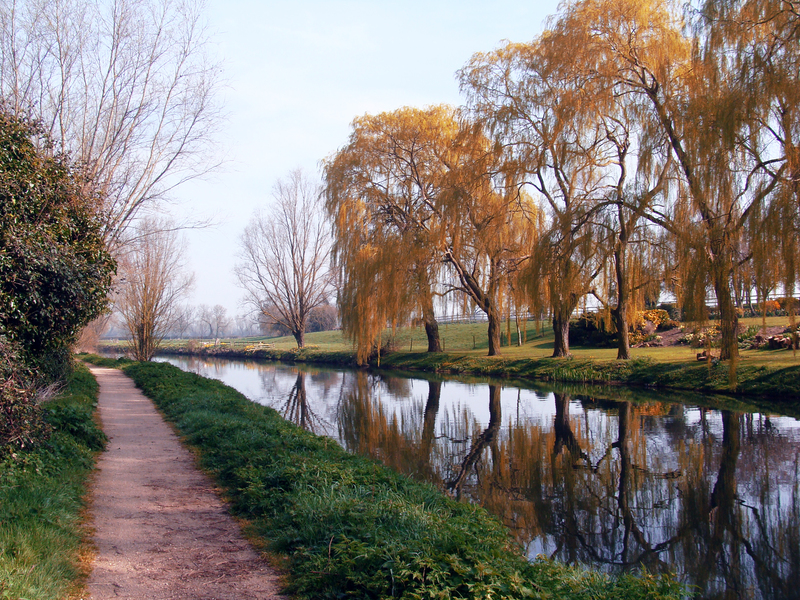 After clearing Cambridge and marching my bike through a footrace in a beautiful country park, I was riding the smooth beautiful path along the River Cam. 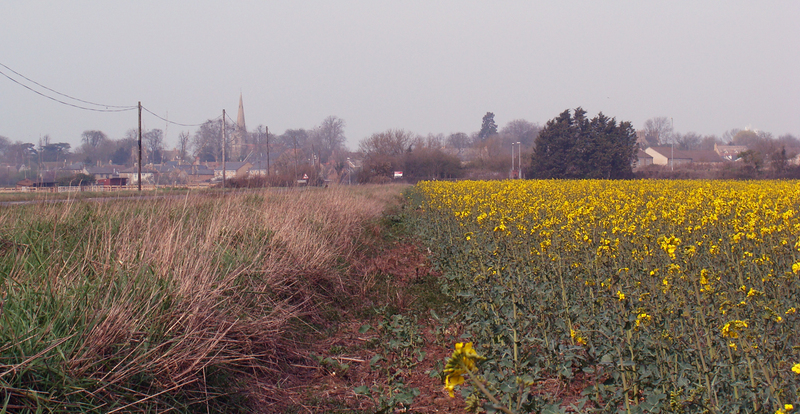 After just a couple miles I was the path left the river and entered the small town of Waterbeach. I followed the signs for Route 11 into the center of town, where the signs suddenly only pointed backwards. No matter – I simply cycled along my planned route back to the river where the path should pick up again. Just where I expected, there was a gate and a sign marked “Public Footpath”. Someone had stuck the gate shut with some rope, which I dislodged to allow my passage. The path was covered in grass, but trod down enough for riding. After a half mile more, there was a turnstile. I lifted my cycle over and passed, but in another half mile waited another turnstile. The riding was getting more rough, the path more overgrown and cut by ridges of dried mud that caused my bike to jostle and slide. By now I was beginning to wonder at the legitimacy of my path. Perhaps I’d lost Route 11 and I was supposed to be on the other side of the river. I had seen a young man walking along that bank. There were two cyclists ahead of me, though, which was reassuring. I decided to simply weather the bumps and relish the off-road experience as much as I could. Then I encountered the barbed wire. Now instead of having to navigate a gate every half mile, I was climbing over or snaking under wire, clambering over half-collapsed rusted gates, or leaving the path altogether circumnavigating obstacles I could not surmount. 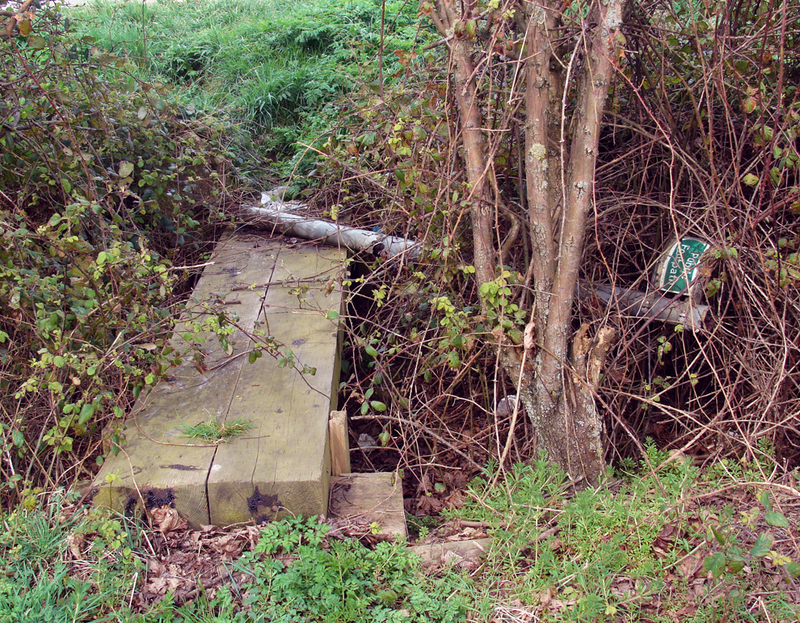 As the terrain tried to toss me into thickets of brambles, I passed a sign: “Cambridge – 7 miles. Ely – 10 miles.” Half of my mind was daunted that I was less than half way to my destination after two hours when the projected travel time was an hour and a half. 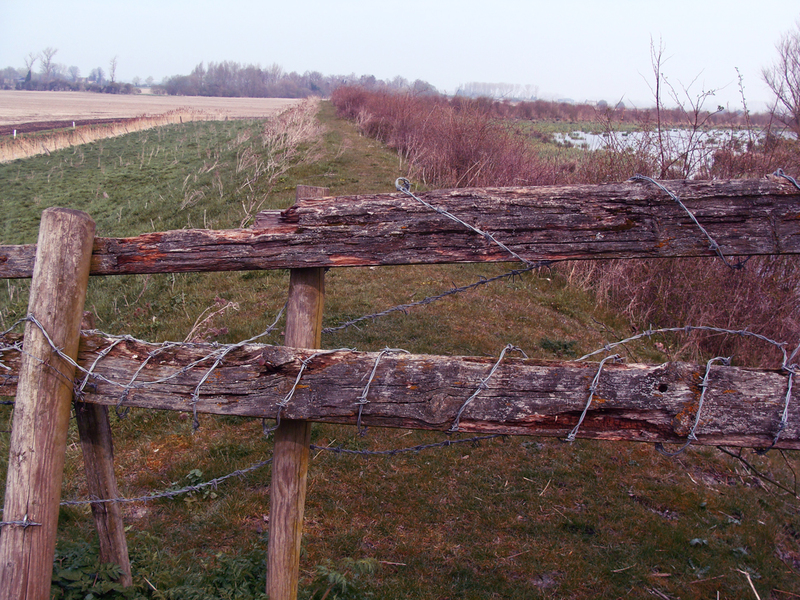 The other half of my mind was in disarray, wrecked by the ridiculous signpost fenced in by water and barbed wire. Soon the two cyclists I’d spotted earlier (and subsequently passed) convened with me to puzzle over a map (seriously, not just a signpost, but a map) posted along the impassable “Route 11”. It indicated a road I had been expecting to meet just a mile away. I was hopeful for the road, and what smooth cycling it could bring me. My plan was to take the first right off the road to rejoin the river and continue on to Ely, but after seeing that this path was no different from the one I had just left, I instead followed the road. Soon I spotted a tower rising in the distance. Could it be Ely Cathedral!? I cycled excitedly past fields of flowers towards my goal. But upon arriving, signs hanging over shops proudly announced that I was in the town of Stretham. And search as I might, I couldn’t find any signs pointing to Route 11, only a road called “Ely Road,” which I was fairly certain was the A10 highway between Cambridge and Ely. While this may seem like an appealing and straightforward route, A roads with one or two digit designations tend to be for motor vehicles only, and even those that aren’t can be dangerous for cyclists since they are not expected by motorists. Even cycling on A or B roads with four digit designations has made me uncomfortable unless there is a separate cycle path. “Public Footpath”: Note the fallen sign. Having clearly learned nothing from my day’s struggle, I followed a sign for a “Public Footpath” that additionally indicated “Ely”. This, to me, felt promising. It ceased to feel promising when it propelled me through brambles onto the A10. I watched my two cycling comrades zipping by along a cycle path adjacent to the highway. As any reasonable person would expect, once I was cycling on a real and legitimate route, I arrived in Ely rather swiftly. learned a lot about stained glass. I was largely ignorant of the history and technique of the craft. I was also surprised to see several examples of secular art, since I had thought of stained glass as an anomalous medium that hadn’t been explored in the art world outside of religious art. Even within exercises of painting religious icons and parables, however, there is no lack of experimentation both in concept and technique. One example took an abstract approach to the temptation of St. Anthony while another used alterations of the glass to make the image gain new features when viewed from an angle. The gallery showcased many different approaches to color and form, with artists employing enamels, powdered oxide paints, and the lead lines holding the panes to achieve their effect. 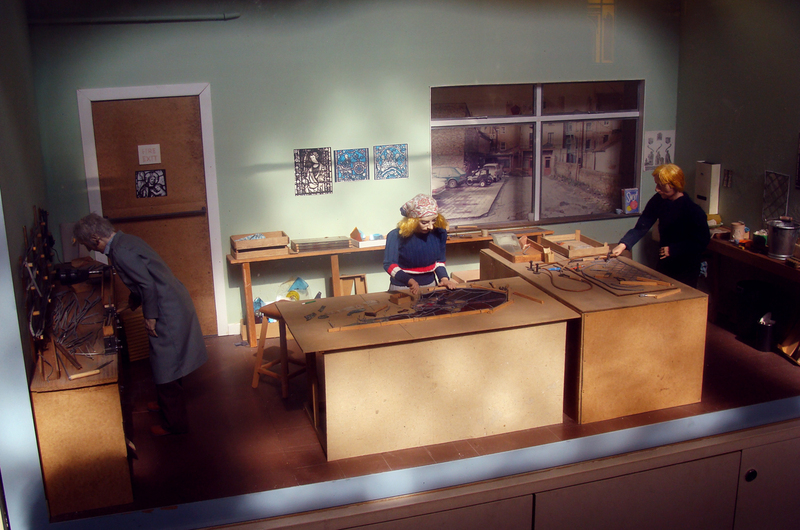 Diorama of a stained glass workshop. After grabbing a quick bite to eat and having a look around a bookshop, I decided to check out the local football (soccer) match. I cycled from the city proper to the pitch just in time for kick-off. Unfortunately I don’t have much to report. The first half was exciting with quite a few good saves and tries, and some decent work moving the ball. The second half fell apart, with most passes from both teams missing their intended targets and generally just poor play. The crowd wasn’t very rousing either, the father and son on my left disinterestedly checking their phones and the group on my right mostly cracking inside jokes and taking the piss out of players and the rest of the crowd. I decided to leave about three-quarters through. It was now just two hours until sunset, and without yet knowing how I was going to get back to Cambridge short of taking my bike aboard the train, I decided to skip my plan of attending the evensong prayer at the Cathedral. The headlight on my bike had also been jostled loose by all the bumps earlier and now ineffectually pointed at the ground, so I was anxious to depart before the light let out. After spending about a half hour cycling around Ely and striking off along a highway before deciding it was the wrong way (it wasn’t), I eventually found a sign for the elusive Route 11. Following it took me along the river again, which made me a bit nervous, but before long I was headed off east. I realized then that I was headed towards Wicken Fen, and sure enough I ended up retracing the same route I took on my cycling trip a few weeks ago. Reviewing a map of the National Cycle Network, I learned that Route 11 begins north from Cambridge to Waterbeach where it abruptly ends (hence the signage that only pointed back the way I’d came), while another branch of the route picks up on the other side of the river. The map warns to take Route 51 through the fens to join Route 11 there because the necessary bridge connecting the two branches has yet to be constructed. In total it took me five and a half hours traveling more than 42 miles to spend four hours in Ely. I missed a few attractions I was curious to see like Oliver Cromwell’s house, the aforementioned evensong service, and simply spending some time by the riverside, parks, and looking into shops, so I may yet return for an afternoon. Next time I’ll probably do it by train, but as this entry reflects, sometimes it’s truly all about the journey. 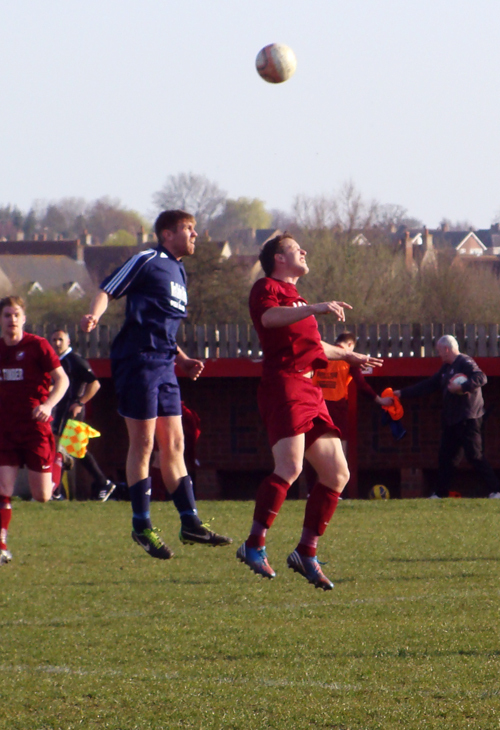 This entry was posted in travel and tagged Cambridgeshire, cycling, eel, Ely, fen, football, narrative, soccer, stained glass on March 30, 2014 by Dylan Bargteil.